In the StockNote app, a Guest user option has been provided to explore the app before becoming a SAMCO Customer. You need to register using the Facebook or Gmail ID and confirm the mobile number using an OTP (One Time Password). 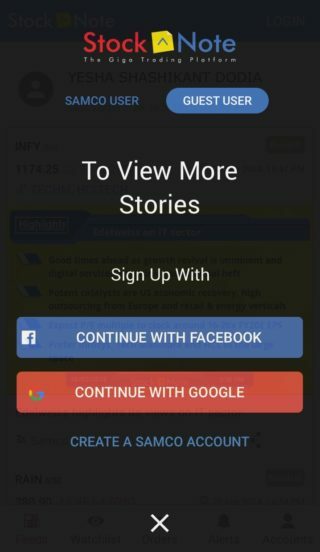 However, the Guest User login does not allow you to fully utilize the benefits of all features of the app and has limited benefits. You cannot view all the notes and also cannot buy or sell anything. To unlock and access complete benefits of the StockNote app you need to become a SAMCO Customer. 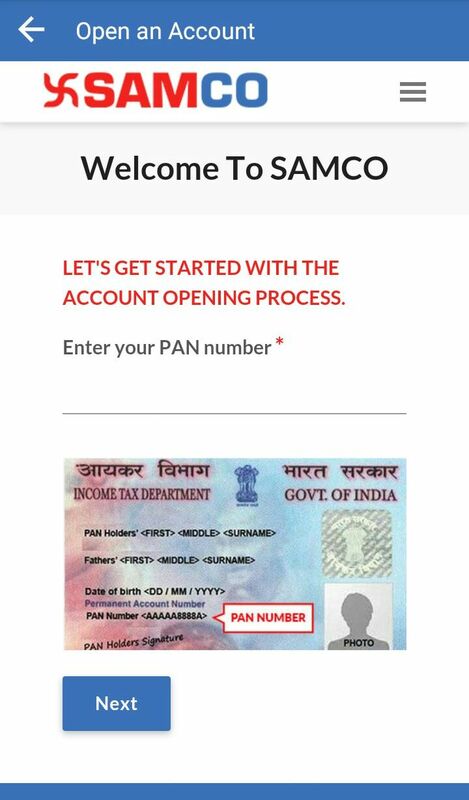 Being a technology driven company, we have made account opening with SAMCO completely paperless. 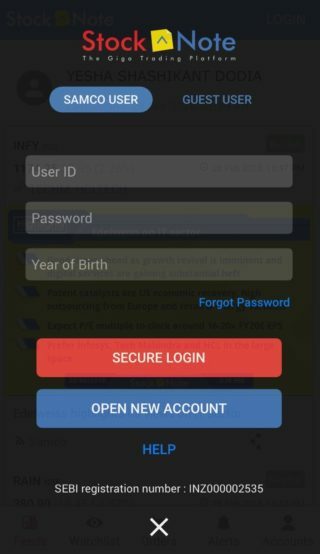 You can open an account only using your smartphone. That’s it! All you need to do is click on “Open an Account”. After this, you will need to enter your basic details like Name, Email Address, Mobile Number & City to proceed. Post this, you need to verify and reset the password using the link provided by SMS or email. After the verification is complete, you need to enter the PAN and date of birth as per your Pan Card. 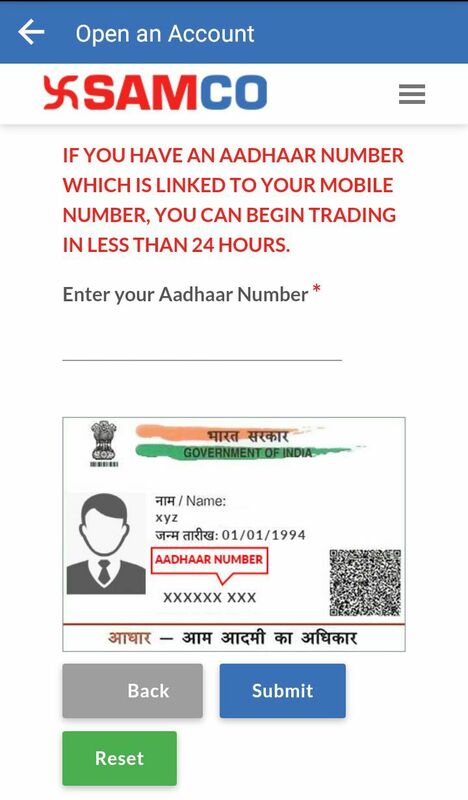 Next, enter the 12 digit Aadhar Number and enter the OTP sent to your mobile via SMS. This will fetch most of the details which are there in the Aadhar Database and you need to update the rest of the details like Bank Details, Segment Selection, etc. Post this, you need to upload the scanned copy of Pan Card, Signature and income proof. Next, you need to enter one more OTP for e-signing. This will ensure that the documents and the account opening form are digitally signed. The whole process will take less than 5 minutes. In the next 72 working hours your account would be opened and you shall receive a welcome letter on your mail. Congratulations! Now you are a SAMCO Customer and can enjoy the unlimited benefit of StockNote – Best Mobile App powered by Giga Trading. For more aticles on StockNote app visit StockNote section on Knowledge Center You can also find many useful articles on trading, investing and market knowledge, visit our Knowledge Center section. You can also refer the tutorial video for guest user. I am an existing customer of SAMCO. How can I login. Hello! Thank you for getting in touch with us. In order to access your account, please use the User ID & password which we’ve provided you. You can log in using three terminals, i.e. Web, Trader Software and mobile app. Here is the link to the web terminal. You can download the mobile app called ‘StockNote’ from the Play Store. And here’s the link for the downloading the trader software in your PC. In case you have any questions or need any help, email us at Support@samco.in or can raise a ticket on https://www.samco.in/support , or contact us on the following numbers + 91 22 2222 7777 , +91 22 6169 9000; our Executive will resolve your query. Greetings! Thank you for getting in touch with SAMCO. We have a total of 3 terminals available. Please choose the one which is more convenient for you. We’ve got a mobile app called StockNote (you can find it in the Play Store & App Store), the next one is a web terminal (trade.samco.in), and finally, the last one is ExE software called Nest Trader. Beside these self-trading tools, we also have a provision for call & trade, where you get to place your order telephonically. We hope this resolves your queries. In case of any more issues or queries, please feel free to contact our offices. Our executives would love to assist you in the matter. Thank you so for your time. Have a great day!